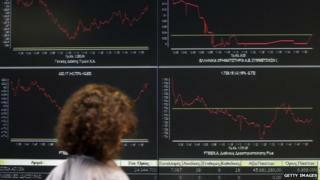 European stocks have fallen after a Greek minister said that Athens would struggle to meet its upcoming debt payments. Interior Minister Nikos Voutsis made his comments during a weekend TV programme. Stocks on Greece's ATG index closed 3.11% lower at 814.06. Greece still needs to strike a deal with its creditors in order to release €7.2bn (£5.1bn) in remaining assistance. "The four instalments for the IMF in June are €1.6bn, this money will not be given and is not there to be given," Mr Voutsis said. The country's finance minister meanwhile has told the BBC on Sunday that progress was being made. "Greece has made enormous strides at reaching a deal," Yanis Varoufakis told the Andrew Marr Show. Other benchmark indexes across Europe have also fallen. The IBEX closed down 2.01% to 11,322.3 after Spain's voters punished the ruling Popular Party (PP) in local and regional elections. "Sunday's losses by the ruling party are seen as a protest against the country's economic hardship, which is shown most clearly in an unemployment rate of 23% - and more than double that among young people," said BBC economics correspondent Andrew Walker. Financial markets were unsettled by the vote against an economic strategy that many investors broadly support, he added. France's Cac-40 closed down 0.5% to 5117.1, and Italy's MIB closed down 1.94% to 23,305. Stock markets in London and Germany were closed for public holidays. Video Greece debt crisis: Could a deal be on the cards?